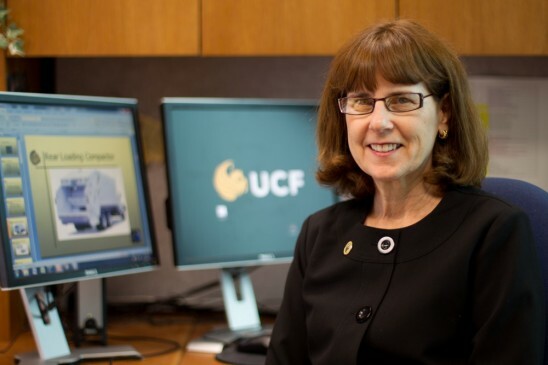 Debra Reinhart, assistant vice president for research & commercialization, has returned to UCF after two years of service with the National Science Foundation and intends to use the experience she gained with the agency to bolster the university’s competitiveness in submitting winning research proposals. UCF researchers submit more than 1,200 proposals annually, a number that the university hopes to increase. Reinhart plans to share her experience gained by managing NSF’s $12 million Environmental Engineering program , reviewing proposals and working with universities across the country to achieve the agency’s goals. She has developed a presentation that she plans to share with researchers across campus on October 14 and October 17, from 10 a.m. – 11 a.m. in the Student Union. She is interested in helping any faculty member who needs assistance with proposal development, particularly proposals to NSF. Reinhart has extensive experience with UCF. She received a bachelor’s degree in environmental engineering from the university. After receiving her Ph.D. in environmental engineering from the Georgia Institute of Technology she came back to UCF where she is a Pegasus Professor, serves as a professor of environmental engineering and has held administrative roles ranging from executive associate dean of the CECS and interim dean of the NanoScience Technology Center to her current position. Earlier this month the university announced the addition of an additional assistant vice president for research to emphasize the acquisition of federal funding. “We recognize that our faculty are capable of competing with the best faculty in the country for research funding and we want to give them all the tools we can to help them be successful,” said MJ Soileau, vice president for research & commercialization. In 2010 UCF was ranked as a research intensive university by the Carnegie Foundation for the Advancement of Teaching, largely because of its strength in working with industry and commercializing technology. UCF was also ranked number three in “patent power” by a leading engineering industry group.